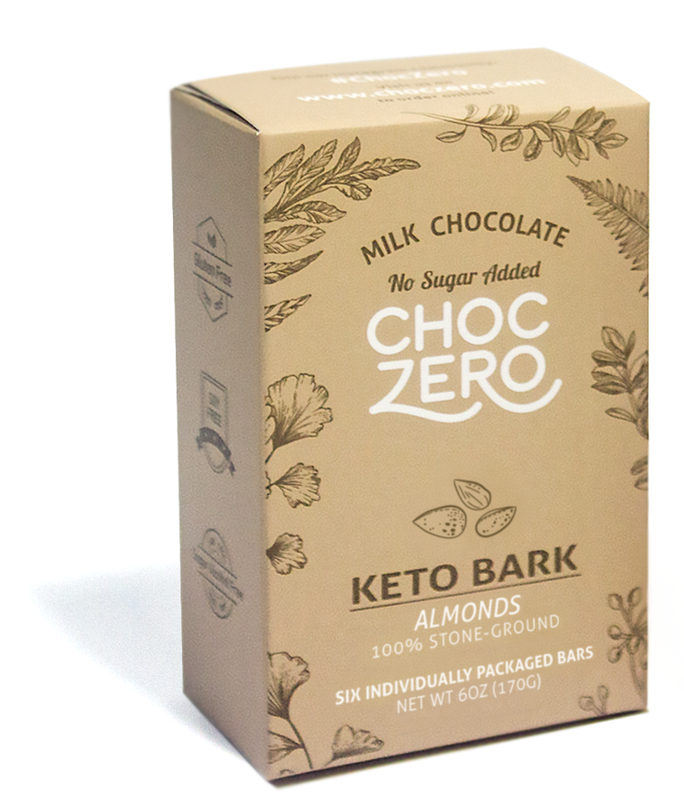 Is ChocZero Keto Bark Keto Friendly? At the time of writing this post, I’ve been on the ketogenic diet for over five years and logged over 250 blood ketone tests in an effort to estimate the effects of food and ingredients on my ketosis, including those in ChocZero Keto Bark. ChocZero Keto Bark is marketed right at us with keto right in the product name, but anyone can slap "keto" on a label. Just how keto friendly is this "keto bark"? In this post, I'll evaluate ChocZero Keto Bark, give them keto friendly grades, and see how they stack up against other low carb treats! A: Completely compatible, positive or no impact on ketosis. B: Highly compatible, but don't go too crazy. C: Moderately compatible, be mindful and limit intelligently. D: Barely compatible, detrimental to ketosis and not recommended. F: Not compatible, overdo it just a little and kiss your ketosis goodbye. Net Carbs per Serving: How many carbs are in this thing? Net Carbs per 100 calories: Since serving sizes often vary significantly, a net carb per 100 calorie ratio is a more consistent measure of keto-friendliness than net carbs per serving. Lower ratios are also an indicator of higher fat content because fat has more calories per gram than protein and carbohydrates. Sugar: Sugars have a higher glycemic index and larger negative impact on ketosis than other carbohydrates. Hidden Carbs: Hidden carbohydrates are based on the caloric values and glycemic indexes of ingredients sometimes classified as fibers or sugar alcohols. Easy to Overeat: Some foods are easy to over-eat and require extra willpower to limit overeating which is an important factor to consider. Nutritional Density: Foods that are relatively high in net carbs per 100 calories but are high in nutrition per calorie can still be worth eating like broccoli and cauliflower. Overall factors: Each of these 28g bars has 8-13g of soluble corn fiber minus a bit from almonds, hazelnuts, or coconuts. For fibers like soluble corn fiber, I count ~10% of the total as net carbs, for simplicity I'll be adding 1g of net carbs per serving, which will be reflected in the net carb counts and grades below. Also low nutritional density and easy to overeat. You could have a piece or two of ChocZero Keto Bark and probably be fine, but I like to make sure my desserts are binge-proof. Knowing if I go a bit overboard, I’ll still be in ketosis the next day is important to me, especially with desserts like these which are so easy to over-eat. Luckily there are more keto friendly dessert options out there, so we can get our fix without risking our sacred ketones! As you can see, when comparing ChocZero Keto Bark to the best keto-friendly treats out there by net carbs per 100 calories, which is the most consistent indicator of keto friendliness, there is a pretty wide gap. So in conclusion I recommend going with more keto friendly sweet treats like ChocoPerfection, Nui cookies, Keto Bars, and F-Bomb pouches. My personal favorite is ChocoPerfection, it gets an A- keto friendly grade and an A+ in taste from me. They have a lot of great flavors too, dark and dark mint are my favorites and Raspberry is the only flavor I don’t like. The dark mint with a handful of macadamia nuts tastes just like thin mint cookies. You get the classic mint chocolate flavor with the salty and crunchy macadamia nuts, it’s my favorite ultra low carb dessert. If you’re interested in trying some I’d recommend getting the variety pack and a pack of the dark chocolate so you can try all their flavors and still have more of the dark which you’re going to like anyways. They have free shipping in the United States too which is sweet. I also highly recommend Nui cookies, Keto Bars, and F-Bomb pouches, they're all ultra keto friendly and delicious. For more expertly curated and guaranteed keto friendly products check out the Keto Shop! Note: This post contains affiliate links that make me a small percentage of the sales at no cost to you. This is currently the best way for me to keep Savage Fuel sustainable and work towards developing and producing original ketogenic products that I wish existed. Disclaimer: I am not a doctor. Please consult a medical professional before making any medical decisions. These are my personal opinions based on years of practicing the ketogenic diet. Are Epic Meat Bars Keto Friendly? Are Muscle Pharm Combat Crunch Bars Keto Friendly?